Dave was a member of the first class to graduate from the RIT Industrial Design program in 1974. He has worked as a designer and design manager in many areas of the design industry. His early work includes: consumer & industrial product design, packaging, advertising & graphics, signage & way-finding. Preferring diversity and a wide range of problem solving opportunities, the bulk of his career was focused on trade-show, museum & exhibit design. As he worked with a wide range of clients in private industry, government and consulting offices he became versed in defining client needs. With his sharpened design awareness and interpersonal skills, Dave discovered that not all design challenges come from clients but come from everyday life. As with many designers – design has become a way of living life, a skill set for defining and living a productive, fulfilling life. Dave continues to provide design consultations, teaches design at RIT and Nazareth college and provides volunteer design services to area museums and historic sites. Situation: Existing trade-show exhibit was physically & visually heavy and oppressive. Task: Develop a set of new light weight, reconfigurable, exhibit properties that would project a new clean, contemporary, fun look of the company and it's products. Result: Developed a collection of light weight tension fabric wall panels suspended from a truss system to provide modular perimeter walls centered around a hard wall, panel system for lockable model shop & storage. Bright white panels featured colorful Fisher-Price theme icons and age related photos of infants and babies that provided the backdrop for different product lines. Situation: Museum is housed in a large clear-span aircraft hanger space which features full sized aircraft, multiple permanent and rotating exhibit spaces each telling different stories. The vast space within the museum is overwhelming for visitors because they couldn't find what they wanted to see. Action: Following the design process, meeting with stakeholders, similar museums and exploring different ways to guide people. 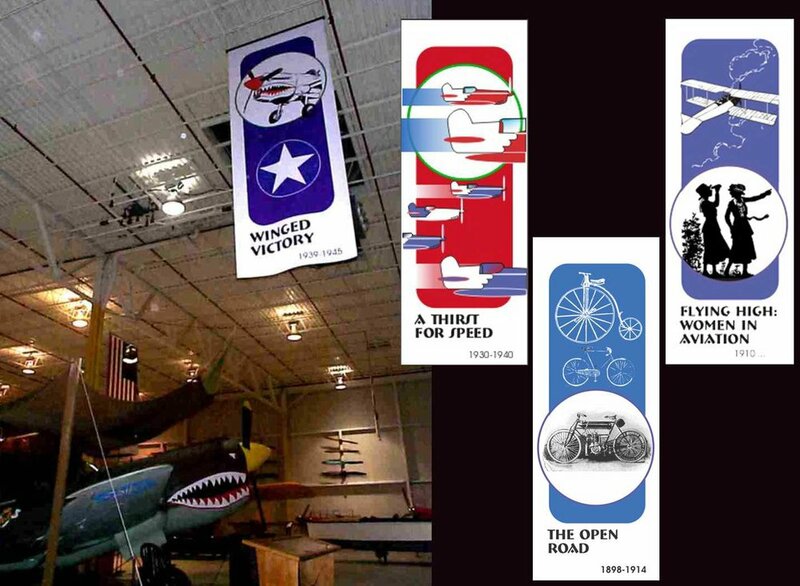 Result: Original artwork was created for 14colorful double sided 12 x 4 ft banners which are suspended from the roofing truss to provide long distance visibility for exhibit areas.